Ask fellow campers about "Vermilion Sunsets RV Park" and nearby attractions. 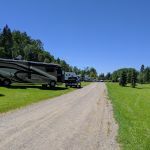 My search for a camp site large enough for our 43' MH and with full hookups taught me one thing: full hook up campgrounds in this part of Minnesota are rather rare. And those you do find are a bit pricey. Our goal was to visit the Vince Shute Wildlife Sanctuary and this campground was close enough. It was about 30 minutes to the Sanctuary. We arrived while it was raining, went to the Marina next door to register. They told us to select any available site. Half the sites were unoccupied, we found one large enough and just level enough to accommodate our coach. Hookups were fine, it was very quiet. Grounds could have been better maintained, however, they had about 7 days of rain when we arrived so that probably impacted their mowing schedule. We'd stay here again. We camped at Vermilion Sunsets RV Park in a Motorhome. Visit Vince Shute and Vermilion Falls, both are well worth the trip! This is your basic "place to park the rig" type of park. Generous sized sites. No facilities other than hookups. Brand new this year (2007), trees planted and sod laid, but will take a season or two to 'look nice'. Minimum stay 3 nights=$99.00. 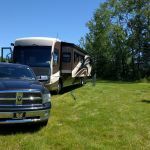 We camped at Vermilion Sunsets RV Park in a Fifth Wheel. Are you affiliated with Vermilion Sunsets RV Park ?